When a horse is emotionally let down, pain free, and focused on the task, then a person can accomplish beautiful movement and connection with minimal equipment. When he feels better, he behaves better. I have no use for mechanical aides to get a mechanical robot to perform in a submissive manner. For me it is not what the horse does, but how he is feeling while he is doing it. It is a way of life. Whether we are doing nothing in the pasture together, trotting a half pass across the arena, or working a cow, I am always aware of my horse. And I am always looking for softness and a willing partner. Part of training and rehabilitating horses is making sure everything is correct, from hoof balance, to saddle fit. I spent 20 years fitting saddles to horses, and working alongside other master saddlers and saddle makers. I worked with western, english, and every saddle in between. I don’t find many companies out there who care much about saddle fit, unfortunately. But the few that I have found, are doing excellent and cutting edge work. And most importantly, the companies have integrity. I have been to hundreds of barns to do craniosacral on horses, and with that I usually am checking the tack. So I have seen A LOT of saddles! Towards the end of 2013, I decided to become an authorized fitter and rep for Custom Saddlery brand dressage saddles. I am very excited to offer these saddles as I am seeing horse’s backs improve in a matter of 2 weeks after going in them. The seats also make a huge improvement in the rider’s position as well. Which is also part of saddle fit. If the rider can not find their neutral pelvis because they are fighting against the saddle, the communication to the horse gets blurry. Horses have been a part of my life for the majority of my life. I founded Stewart Ranch in the late 90's where I focused on creating a holistic environment, and incorporating educational seminars and clinics. I found myself with a ranch that had huge potential, so I spent the first year renovating it and creating a home for me and a peaceful environment for horses. 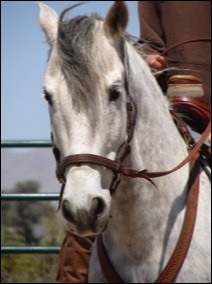 Every 6-12 months or so, I would bring in a professional to teach a clinic on some aspect of horse well-being. And as each year progressed, I found myself teaching my own clinics, and training all kinds of horses. From starting young horses under saddle, to re-educating the most difficult horses, to having other horse trainers bring me their horses to help them get to a better spot. I had a strong client base with boarders who were in some kind of lesson or training program, and every year I spent 6 weeks with Harry Whitney in Arizona to enhance my own skills. Usually bringing the most challenging horses I had in training, or a young horse to start under saddle. Towards the end of my stay in CA, I found myself with a full load of training horses, all with extreme and dangerous issues. 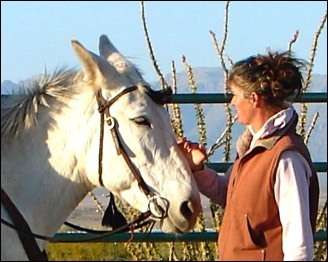 It was around that time that I started exploring equine craniosacral therapy. I was familiar with craniosacral therapy because I had been receiving since the late 80's on myself so I knew it was a special. As I completed each workshop, I incorporated what I learned with the horses in training so I could practice my feel. I found that I had a knack for this work, and it resonated with me on a deep level. What kept me intrigued was the change I was seeing in this group of training horses that I had at the time. There was a settledness that the horses had, a lightness in their riding and just an ease to their expression. One little horse was a cribber and I noticed a drastic changed in how often he cribbed. I started getting interest from other clients and friends throughout CA after hearing about this work I was doing and the wonderful results. So, about a year after taking all levels offered in equine craniosacral, I branched out and began working on horses outside of my ranch. I still felt like I had barely scratched the surface of this therapy, but the feed back from clients was remarkable to me, and honestly that feed back is what kept me motivated to offer this service as well as lessons and training. About a year later, I decided to relocate to Texas, and I immediately met Ryan Hallford. He not only had a clinical practice, but also was developing his own school. He let me take his level 1 class and I even brought some of my horse bones for us to look at. I was able to continue my education taking up to advance levels of biodynamic craniosacral. His courses have been life changing for me in my equine craniosacral practice. I am able to practice with more precision, get deeper changes, and have a clear understanding of what is happening during a session with a horse that I was not understanding during that first year. Completing over 450 hours of training, and have worked on thousands of horses. Shortly after moving to TX, I took advantage of an opportunity to delve more into saddle fitting. As this was the perfect compliment to the rehab work that I was already doing. Having an in-depth understanding of functional anatomy, biomechanics, and physiology, this was quite an easy transition. David Genadek Master Saddle Maker and presenter, 2002- present. David came to my ranch for many years to give his wonderful lecture and help fit horse's saddles. We worked on hundreds of horses backs and saddles together over that decade. I appreciate his desire to continue his own enlightenment. Ryan Hallford CranioSacral Specialist and Educator 2010- present. I have completed levels 1-5 of Ryan's biomechanical and biodynamic craniosacral courses. I am currently in the process of completing his ten level certification course. Ryan's teachings are forward thinking and on the leading edge of craniosacral therapy. Having completed programs from Michael Shea, Hugh Milne, John Chitty, Upledger, and studied from numerous osteopaths, he has a quality training program consisting of the best elements from multiple schools. Having Ryan as my mentor has enhanced my equine practice tremendously. Not only have I become more settled into the therapy from Ryan's help, but I am able to operate with a much greater precision. Dr. Deb Bennet Equine Studies Institute, 1999- present. I have attended numerous lectures and presentations of Dr. Deb's over the years, and have studied gross anatomy from her. Most recently I attended her bio mechanical anatomy and full body dissection course in Bend, Oregon. Highly recommend this course for anybody who has horses. Very well done! I have worked along side many veterinarians, chiropractors, and other body workers picking up techniques to incorporate in my own practice. I use Jerry Schmidt for my equine dentistry who incorporates Natural Balance philosophies. I also highly recommend Krysten Dennis to all of my clients. I also studied Equine Nutrition from Dr. Kellon's on-line courses. I provided a community service in Santa Cruz County and was on the horse evacuation team for the Office Of Emergency Services (OES), I also completed Felton Fire Dept's Large Animal Evacuation course. My efforts for horse rescue, rehabilitation, and re-homing were featured on a State wide news channel. I also taught numerous clinics to amateurs and professionals in the industry. Started and re-started hundreds of horses for professionals and amateurs, gave numerous trailer loading demonstrations for the local horse club and for the OES. My favorite clinician to go watch is Manolo Mendez, and I am privileged to own a mare that was personally trained on by him! I am now living in TX and spend time traveling throughout Texas and California to treat horses, teach clinics, and train horses.